Having always been fascinated by maps, I don’t like to throw them away once they are out of date. This piece uses a modified map to reflect on life’s journey, and the influences and choices that can have such a great impact on it. We are lucky if we get a second chance. This piece was awarded first place in the Art Quilt category at the National Quilt Championships, Sandown in 2008. 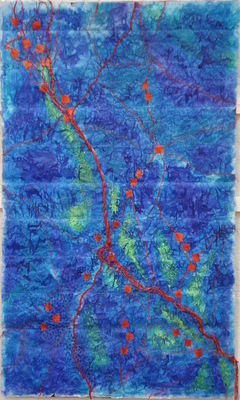 Materials: Painted and dyed recycled map, cotton scrim and felted blanket. Commercial threads. The folds of the map remain visible. Method: Painted map bonded to scrim for strength. Hand stitched and quilted. Printed words appliquéd to surface.